October 29, 2016 — I want to show you the perfect pumpkin. 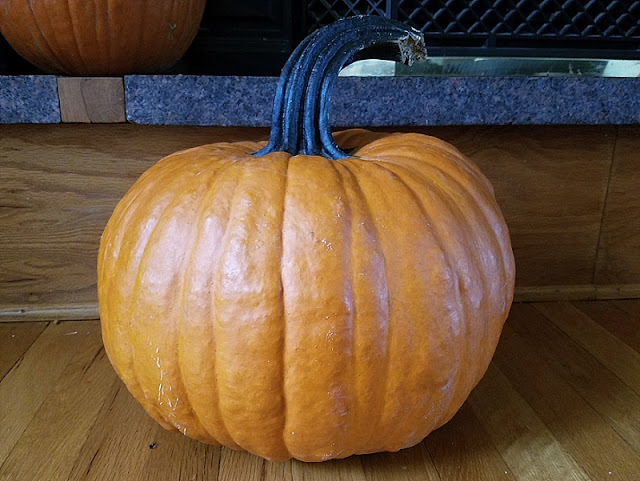 I mean, it’s not the only perfect pumpkin. You more than likely have the perfect pumpkin, too. They all eventually become perfect to us. They’re like our children in that way. However, unlike my children, it’s rare for me that I fall in love with my pumpkin right away. Usually I dither at the pumpkin patch and/or bin. Then I settle. Then, later, I fall in love. OK. Maybe that is like my children. But not with this guy. It was love at first heft. That thick, gnarly stem. That perfect shape—slightly squashed at the top and bottom, bulging on the sides. Those gorgeous grooves. That orange sheen. It’s a real shame that I bought him for the specific purpose of mutilating his hide. But that is the destiny of most pumpkins: Gutted, punctured, burned, and smashed. 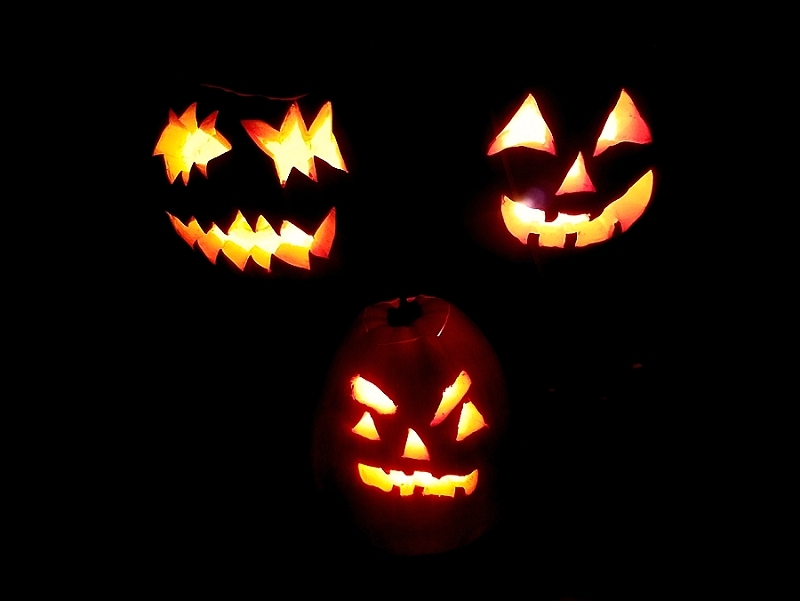 But if it weren’t for jack-o-lanterns, then like 75% of the pumpkin crop just wouldn’t exist. Would you rather never have lived or lived to end perforated and trash-bagged in a can or broken and strewn across the road? This article’s getting existentially disturbing. 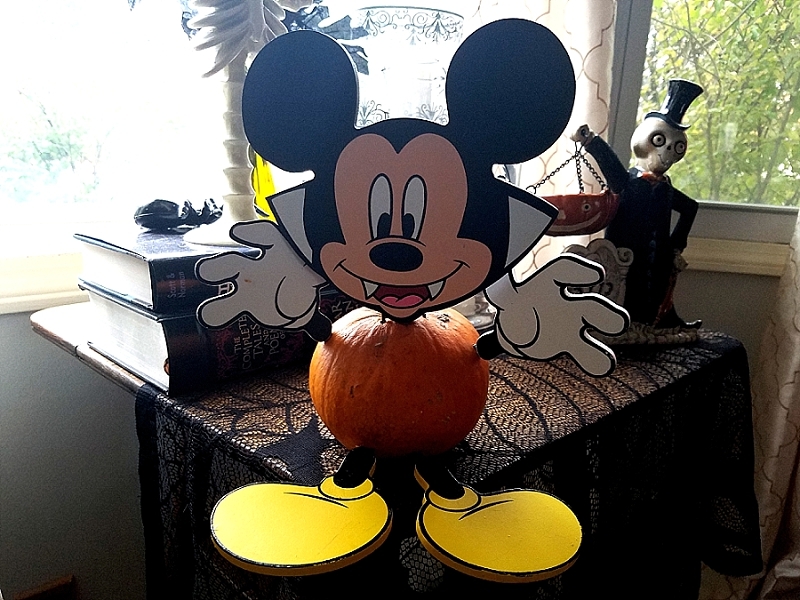 Time for the vampire Mickey Mouse photo. Fortunately, none of that was going through my mind as I threw black plastic bags on the floor like so many body bags at a multiple homicide scene. Next, I sprinkled tiny saws and magic markers around on the floor and then turned on ParaNorman for some background ambiance. Then we carved. This year is the second year that there have been four of us. That means four pumpkins. A pumpkin per child is probably the best reason I’ve ever heard to have a giant family. Well, that and you widen the chance of one of them taking care of you in your old age. My youngest is still too young to handle a blade (responsibly, at least), so we got her a dismembered vampire Micky Mouse kit to shove into her tiny baby pumpkin. That took her ten seconds, and then she curled up on the couch with it like it was a teddy bear, staring wide-eyed at the more toddler-inappropriate parts of the movie. My eldest is old enough to draw her own and, for the first time, cut her own. But she was kind of slow and wanted to move on to making Halloween cookies with Lindsey, so I took over for her after an eyebrow and half an eye. And, honestly, I think she won this year. 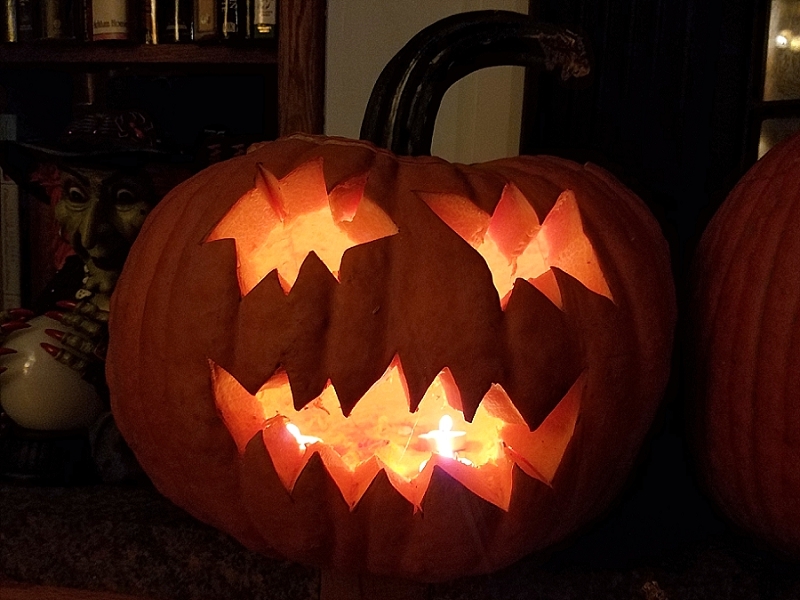 I mean, I’d never have chosen that pumpkin myself, or that face, or drawn it at that small size, and yet it came out with more personality than I have on my best days. 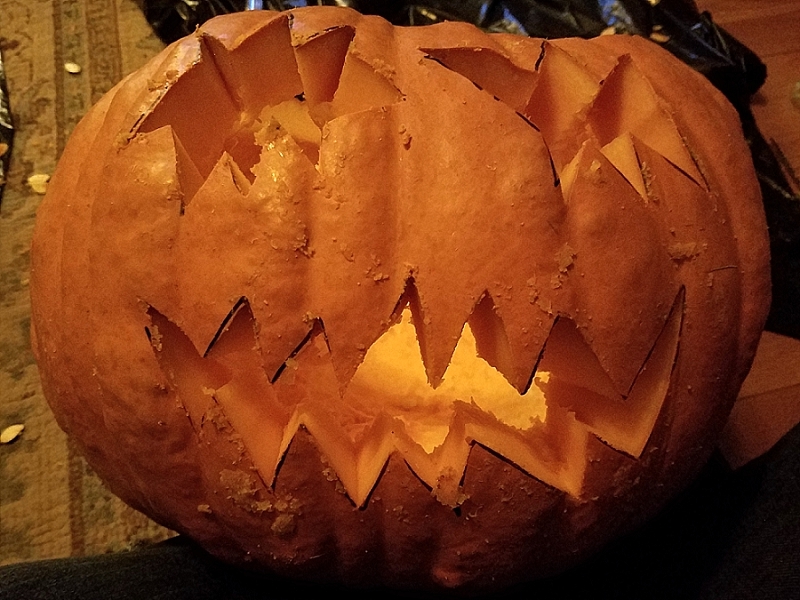 Meanwhile, I took my perfect pumpkin and tortured it until it went insane.